Cover article by Mitch Jacoby on computational approaches to new materials discovery. Rick Mullin reports on Roche's plans to sell 4 API plants in Ireland, Spain, Italy, and South Carolina. The ever-popular holiday gift guide, by Beth Halford. Final plug for Late Night with Chemjobber; it'll be two hours* of guests and call-in fun, starting at 11 PM Eastern on Friday night, November 27. Booked guests: @pinkyprincess (11 PM slot), @seearroh and @drrubidium (11:30 PM slot), Alex Goldberg (11:45 PM), St. Andrews' Lynx (12:00 AM) and Chad Jones (12:15 AM). Click here to hear the show at 11 PM Eastern today, and if you'd like to call in, lines open at 11:10 pm or so. The number to call in is (267) 521-0195. Be aware that technical difficulties may happen, so apologies in advance if they happen. UPDATE: The show has been extended. *If we have lots of callers, I'll try to figure out how to extend the show. New software, not quite sure how to proceed. The properties of product from pilot drying equipment may be significantly different from that of product dried in laboratory vacuum tray dryers. This is particularly true of units that agitate the cake mechanically such as orbiting screw conical dryers. Particle attrition or agglomeration can result in major differences in particle size distribution, bulk density, compaction and flowability. These things in turn affect solubility, bioavailability, formulation, processing, packing and shipping. Therefore, it is not valid to base projected product properties on the results of tray-dried samples when different equipment will be used on scale-up. The behavior of a given product in different dryer types cannot be easily predicted. Bench or small pilot-sized test units are available for tumble or paddle dryers, but the dynamic similarity to large-scale equipment is poor. The best way to determine what the product will look like is by performing pilot studies in representative drying equipment. Sometimes the actual product characteristics will not be known until the first production batch comes out in the dryer. Just in case you thought you could predict the future in this sense, you cannot. Gosh, it is remarkable to me how much is not known in this business. The candidate is expected to establish and maintain an externally funded, world-class research program that inspires a highly motivated graduate student body as well as undergraduate students. Collaborations with existing departmental activities in the fields of photon-based/ultrafast characterization, carbon nanostructures, protein-based high-performance materials, electronic and magnetic materials, medical imaging, and surface and thin film characterization are expected. Other significant collaboration opportunities are available with the Thomas Jefferson National Accelerator Facility, Eastern Virginia Medical School and NASA Langley Research Center. William & Mary also has a strong tradition of excellent teaching at the graduate and undergraduate levels, and the successful candidate will play an important role in the educational mission of the Department of Applied Science. The successful applicant will have full access to a state-of-the-art solid-state NMR facility, which currently has only one other user. The position comes with five years of support at the 100% level for a technician to maintain the NMR equipment who will report to the successful candidate. The NMR facility houses two Bruker wide bore superconducting magnets operating at field strengths of 17.6 T and 7.05 T, each controlled by Bruker AVANCE I high power consoles optimized for solid state experiments, along with several probes capable of temperature controlled (−100 °C to +100 °C) magic angle spinning experiments. Additional shared instrumentation include a PHI Trift-II ToF/SIMS, and a Hitachi S-4700 SEM, as well as a vast array of other characterization instruments. The startup for the position will be competitive. Friends, I have long had the dream of doing a late night talk radio show, and here's my chance. On Friday night at 11 PM Eastern, I'll be going live with Blog Talk Radio. Come here on Friday morning, and I'll have the details laid out. You'll be able to click on a link and listen live, you'll be able to call in and yell at me about my lack of Monday posts and generally have a good time. I hope you'll join me. I'm hoping to have guests lined up for each half-hour slot. The link and number will be posted on Friday by noon Eastern time. Talk to you then. Fascinating cover story by Celia Henry Arnaud on disposable bioreactors. As someone who works in the chemical manufacturing industry, this is an amazing, jealousy-inducing thing to learn about, and the leachables problem would almost be worth getting rid of cleanouts. Hard to put a Hastelloy C reactor in the recycle bin, though. An important article by Jyllian Kemsley on chemical demonstration safety. Interesting letter to the editor on data preservation in the laboratory. On the cruiser Lake Erie, investigators found a grueling schedule with arbitrary weekend workdays; a supply officer so offensive that he was ordered not to speak to any E-6 or below; a crew that spent hours repeatedly cleaning the same places just to look busy; work done and redone because of miscommunication with the shipyard. And the pièce de résistance: a seafaring pygmy goat named Master Chief Charlie. I've worked for some pretty odd ducks in my time, but I've yet to meet a pet goat. Readers, got any good stories? I would add that, unfortunately, medicinal chemistry is increasingly regarded as a commodity in the life sciences field. And, worse, it's subject to substantial price competition from CROs in Asia. That -- and the ongoing hemmorhaging of jobs from large pharma companies -- is making jobs for bench-level chemists a bit more scarce. I worry, though, because it's the bench-level chemists who grow up and gather the experience to become effective managers of out-sourced chemistry, and I'm concerned that we may be losing that next general of great drug discovery chemists. I wish I could disagree with any of this, but I really can't. 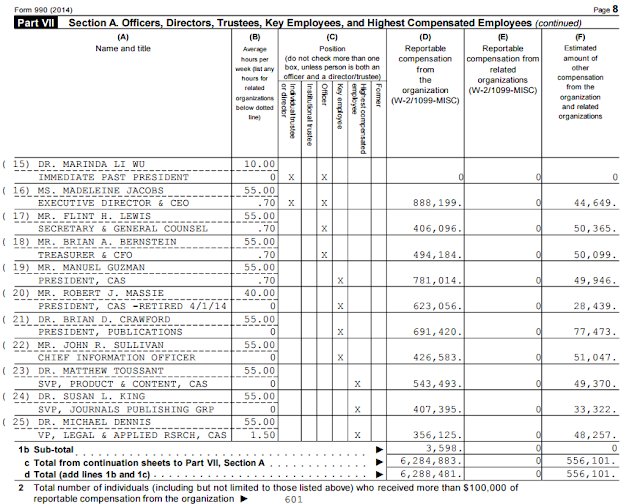 The latest ACS form 990 from 2014. N.B. Madeleine Jacobs has retired and Tom Connelly is now the current CEO of the American Chemical Society. Cover story: Alex Scott writes on using CO2 as a feedstock. Lisa Jarvis has a detailed article on the state of drugs for Ebola. Lots of praise and interest for this David Kroll piece on the controversy around this year's chemistry Nobel. Inspirational article about chemists with disabilities by Linda Wang. Someone is unhappy about pharma's business model in the letters to the editor. In the letters to the editor, Debbie Decker, the current chair of DCHAS, writes on the new cannabis chemistry subdivision. Interesting post by Shane Caldwell about antibiotic resistance as a force of nature. Good, detailed post (in Russian) about what a chemistry lab notebook should look like. A podcast from "Stop. Think. Science!" on science communication. This week, I learned about Stigler's law of eponymy: "no scientific discovery is named after its original discoverer." Bad news for Roche process folks from FiercePharma, with Roche cutting 4 manufacturing sites, 1200 jobs. I see this story as "unemployed scientist makes a statement." Ash, on Linus Pauling's last laugh? Again, an open invitation to all interested in writing a blog, a hobby that will bring you millions thousands hundreds joy and happiness. Send me a link to your post, and I'd be happy to put it up. Hong Kong residents flush their toilets with sea water? I had no idea that Hong Kong residents flushed their toilets with seawater; makes a lot of sense. Something like this would require massive infrastructure investment on the part of a municipality; I presume that inland cities could not bear the cost. It would be fascinating to know which cities on the east, west or southern coasts of the United States are actually close enough to a source of seawater to where this is a viable option. The overview of the ChemCensus, which I'm going to cover below. There were 23,843 respondents to the 2015 ChemCensus; I think that's a ~25-30% response rate, but I can't tell until the full report is released. The unemployment rate for ACS members in 2015 was 3.1%, which is up from 2014's 2.9%. "11% of members in 2015 accepted a job that paid less than their previous position to maintain employment." 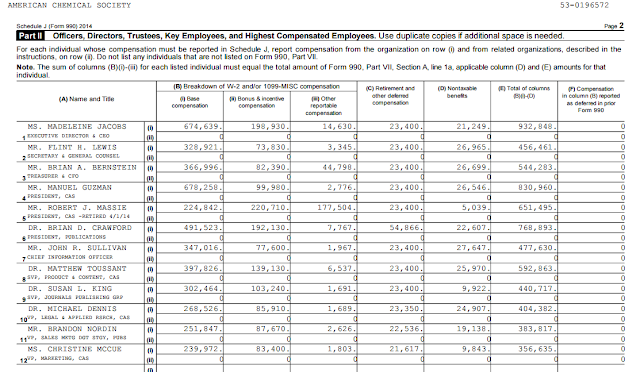 The coastal regions have the highest median salaries, with $118,000 being the median salaries for both the Pacific (WA, OR, CA) region and the New England (MA, CT, NH, VT, ME) region. "21% of members in 2015 said they do not have access to continuing education or technical training from their employer." Back then, graduate schools had a hard time keeping students from dropping out for high-powered jobs in industry. Even foreign students in need of visas were in high demand. “Everybody got jobs in the 1980s,” he remembers. But the optimism that pervaded chemistry departments when Mobashery was in grad school has since dissipated. “Our outstanding students and postdocs still do just fine,” Mobashery says. But average students don’t fare nearly as well. Not all of her fellow graduates have been able to find the job they’ve been searching for, Zhang says. They might be teaching part-time at the test-prep service Princeton Review or at a community college, doing computer programming, or carrying out a postdoc. 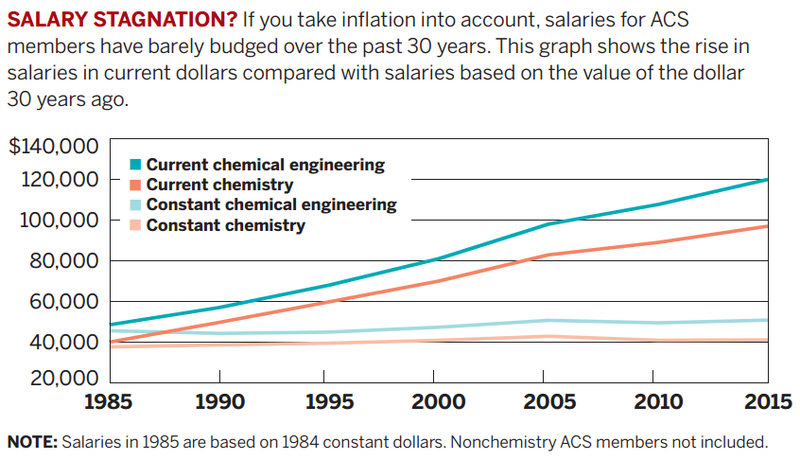 That picture fits with what the ACS ChemCensus data suggest about employment opportunities in 1985 and 2015. “It’s a lot harder to get hired with a Ph.D. in chemistry today,” she says. I wish I could disagree with her. 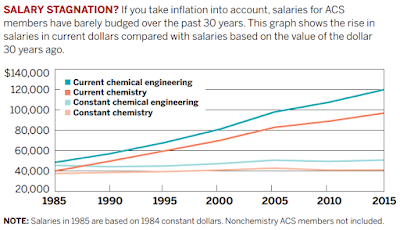 *Gotta say, I miss the graph-based format from the older coverage of the ACS Salary Survey; while the infographic approach is nice, I think the median reader of C&EN is used to tables of facts and figures. Maybe I'm wrong. ...Researchers conducting the National Bureau of Economic Research study analyzed data from over 3,000 U.S. counties and determined that within 100 miles of new production, $1 million of extracted oil and gas generated $243,000 in wages, $117,000 in royalties and 2.49 jobs. 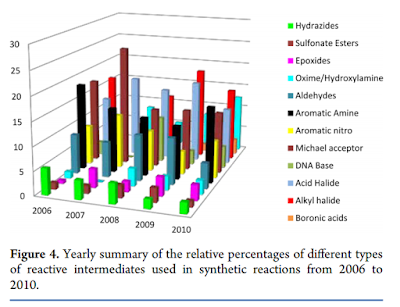 On the basis of this survey, we can conclude that the average number of steps required to synthesize each API was 5.9 and that the average number of reactive intermediates per synthetic route was 4.1. 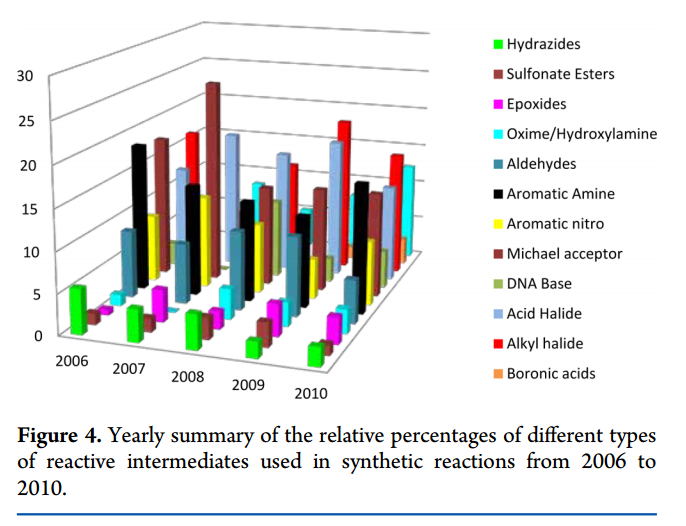 I am somewhat surprised at the relatively small number of boronic acids - I wonder if that number will either rise or fall for the 2010-2015 period? I wonder what future reactive intermediates will be seen? Kingston, RI: The University of Rhode Island desires a physical/analytical chemist at the assistant professor level. Québec City, Québec: Université Laval wishes to hire a computational chemist. " The successful candidate is expected to teach, in French, at both the undergraduate and graduate levels." The Grandest Title I Ever Did See: The University of Minnesota desires "an Assistant Professor, General Mills Endowed Land Grant Professorship in Cereal Chemistry and Technology." I would hope the professorship comes with an unrestricted grant paid in Lucky Charms. Dalton, GA: Dalton State College is looking for an assistant/associate professor of chemistry. Oklahoma City, OK: The Oklahoma Medical Research Foundation is looking for faculty members in functional and chemical genomics. Huntsville, AL: The University of Alabama at Huntsville is looking for a chair of the department of chemistry. Greenville, SC: Furman University has a visiting assistant professor position for a biochemist. ACS dues for 2016 will be $162. 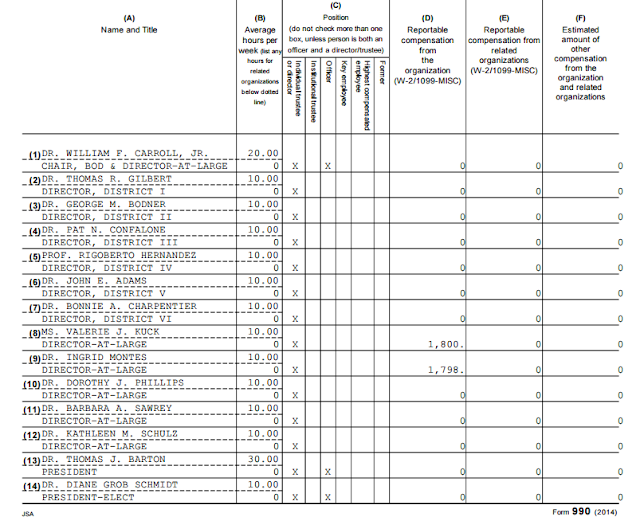 "Bylaw XIII also sets allocations for dues revenue." all of the dues revenue from the Student Member category ($400,000 in 2015) is allocated to the Education Division for support of student programs. 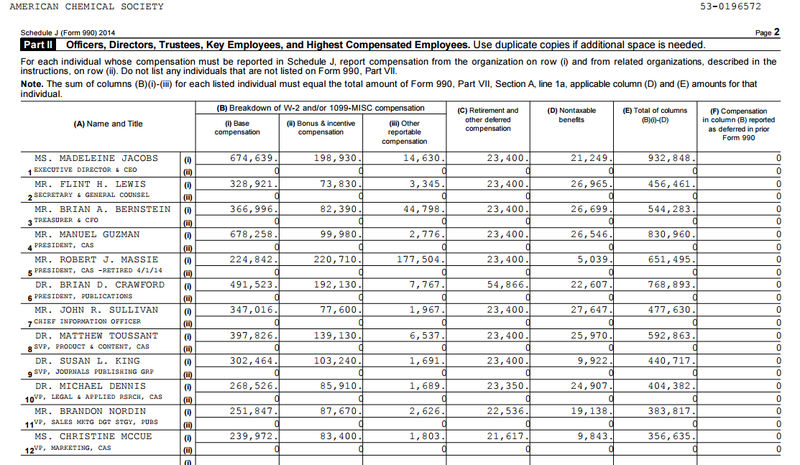 ...Of the remaining dues revenue, $3.34 million supports the Member Services unit that sends you the reminders to pay your dues, processes new membership applications, and maintains basic member benefits; $1.26 million covers information technology (IT) systems support; and $500,000 goes to other charges associated with membership, such as credit card fees and bad debt. That leaves about $1 million, which is used, in part, to help fund all other society programs, including advocacy, career services, awards, national meetings, National Chemistry Week, governance activities, and too many other benefits to list here. 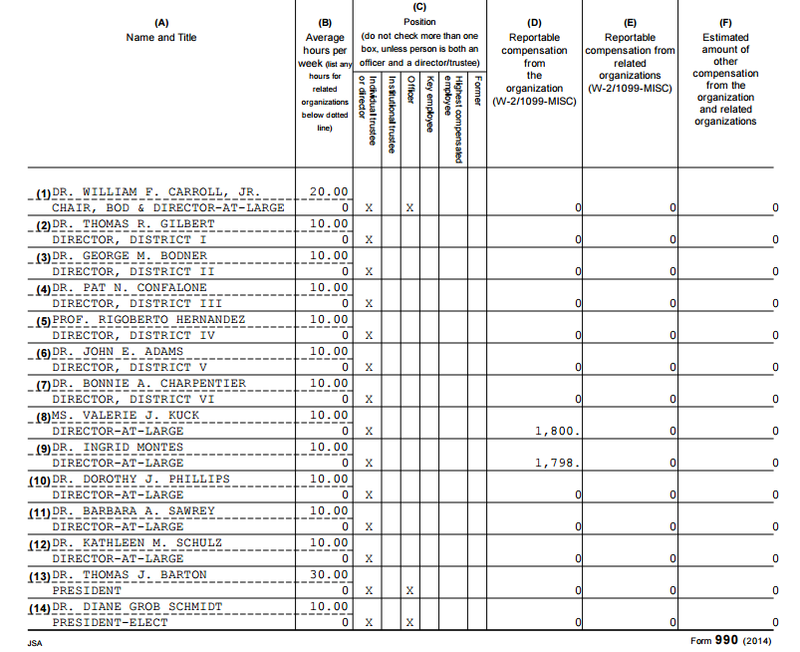 At one-sixteenth of total dues revenue, my contribution in exchange for these benefits was about $10 last year. It is truly surprising to me how little is left for what I would consider societal activities, i.e. national meetings; I guess what matters is what the ACS Pubs and CAS contribution to society activities actually is. ...Academic interest in science was in similar decline: Barely 20 percent of college freshmen were signing up for majors in science, technology, engineering and math, known as STEM fields — continuing a long downward trend. Frederick, MD: Not every day you see a natural products extraction position come up. Leidos Biomedical Research is looking for a senior scientist; Ph.D., 5 years experience desired. Pinellas Park, FL: Transitions Optical looking for a project chemist for lens coatings. East Millstone, NJ: Envigo is looking for a LC/MS-MS analyst. ExxonMobil Research and Engineering has an immediate opening for a Member of the Technical Staff in the Hydrocarbon Science Section of its Corporate Strategic Research Laboratory in Annandale, NJ. 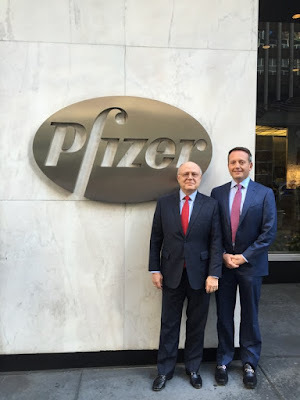 Who wouldn't want to work on Corporate Strategic Research, given the opportunity? Needs a PhD in chemistry, experience with (among other things) "models of complex petroleum or hydrocarbon mixtures is favored." Wilmington, DE: Solenis LLC wishes to hire a senior B.S./M.S. analytical chemist. Newton, MA: The Silent Spring Institute wishes to hire a data scientist. (fixed - thanks, Anon!) Also, a chemist. Cambridge, MA: Always interesting to me to see what Moderna is working on. Fresno, CA: California State University, Fresno is hiring an assistant professor of chemical biology. Troy, NY: Rensselaer Polytechnic Institute wishes to hire an associate or full professor of chemistry for the D’Ambra Endowed Chair in Organic Chemistry; unknown whether the professor will be strongly suggested to work on Saturdays. Bothell, WA: University of Washington Bothell is hiring an assistant professor of organic chemistry. Orem, UT: Utah Valley University desires an assistant professor of biochemistry; unknown whether or not it is tenure-track. Miami, FL: Florida International University is searching for an open-rank position in chemical education. Taipei, Taiwan: Academia Sinica is looking for a research fellow (tenure track) to work on chemical dynamics and spectroscopy. Shanghai, China: NYU Shanghai is looking for a faculty position in computational/theoretical chemistry. The List: The joint ChemBark/Chemjobber 2016 Faculty Jobs List is at 397 positions total. New PhD chemists in industry are "the greatest hazard"? ...Engaging in best safety practices must be an ongoing process, integrated into the daily activities of laboratory personnel. Unhappily, chemistry faculty members today are not often aware of what constitutes good safety practices. It is a skill that is being lost as many knowledgeable chemists leave research labs for other opportunities or retire. And new faculty members under today’s pressures vary widely in their degree of commitment to maintaining their safety skills and helping improve departmental safety. It has been said that the greatest hazard in an industrial laboratory is a fresh chemistry Ph.D. graduate. But our up-and-coming chemists are not our only concern. It is similarly argued that the greatest hazard in a university laboratory is a tenured faculty member who has never been involved in a serious accident. Some of the recent high-profile accidents attest to both of those maxims. The lack of a shared enthusiasm can limit the effectiveness of our safety programs. The concept of a “culture” of safety must survive and must be adopted by all who are involved in ensuring the safety of chemistry laboratories and in guiding our coworkers to safer and more fulfilling lives. Credit: Scheme and table taken from Wells et al. 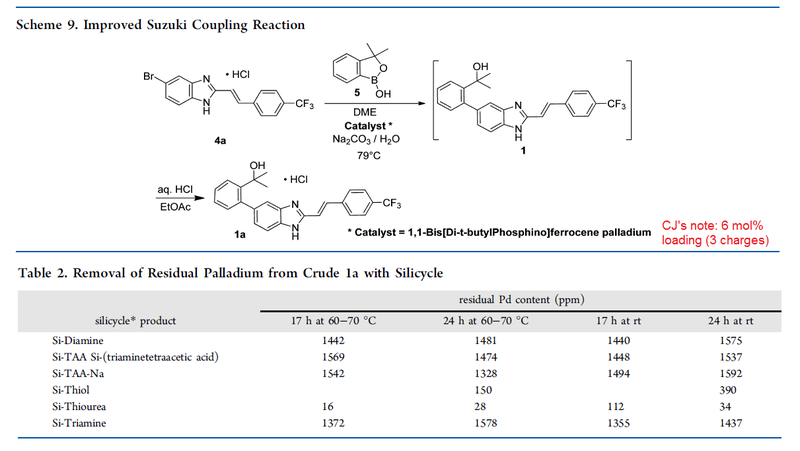 The results presented in Table 2 showed that Si-Thiourea was, in general, most effective at reducing the amount of Pd from product 1a; Si-Thiol was about 5 times less effective, whereas all others were ineffective at changing the residual palladium. It was interesting to find that Si-Thiourea was effective even at room temperature, reducing the residual Pd to 34 ppm, which was within specification for the initial scale-up campaign. However, an unexpected result was found by the synergistic effect of a combination of two Silicycle products, Si-Thiol and Si-Thiourea, when used in concert in EtOAc/MeOH at about 55 °C for 1−2 h, which was not apparent from the screening array. (emphasis CJ's) Their use in combination at 1:1 w/w (total 35−40% by weight relative to compound 1a) proved to be effective at removing residual Pd and decolorizing the product and consistently provided white to off-white solid product with less than 10 ppm of Pd. The authors don't discuss why there was synergy. Anyone have an idea? A neat set of cover stories on chemistry-related startups, edited by Lisa Jarvis. The SLIPS Technology story by Michael McCoy is pretty cool; I dunno why, but I love this idea. I really like the art that goes with it, too. Nice article covering NOBCChe's annual meeting, by Jeff Huber. Someone else is grumpy about the term ab initio.